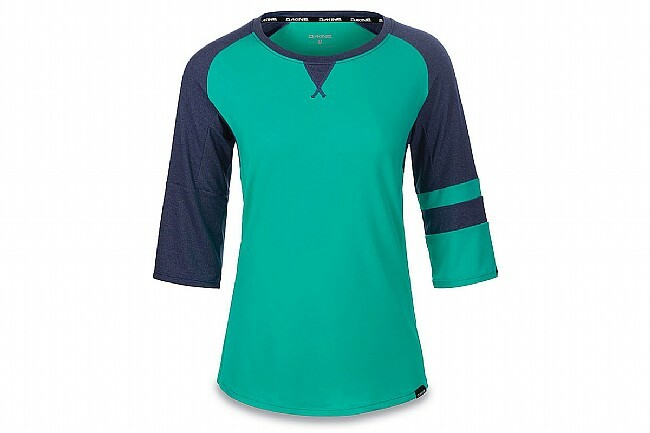 The Women's Xena 3/4 Jersey from Dakine promotes agility, flexibility, moisture regulation, and odor control, equipping you with all the supportive features you need to unleash your inner warrior princess as you get rad on your mountain bike. To reduce bacteria-causing odor and moisture, this jersey is made of a quick-drying heathered polyester with built-in Polygiene Odor Control Technology. This fabric is lightweight as well for optimal agility. The elongated hem and three-quarter length raglan-inspired sleeves facilitate maximum motility so you have the freedom to truly push your limits. Finally, thanks to the flattering high scoop neck, you can shred hard in style, just like the warrior princess would. Interior sunglass wipe; Claimed Weight: 140g.